Although a past of several millennia lies behind the architecture of this land, it was only quite recently that efforts aimed at identifying and introducing its extant achievements were undertaken. Only a few decades have passed since scholars and researchers first began reviewing these works in order to wipe the dust from the face of these resplendent jewels and once again reveal their charming, familiar radiance. The present collection must be considered one of the most significant steps yet taken in the direction of introducing the unknown accomplishments of this architecture. We have entitled it Ganjnameh literally ‘Treasure Book’), because we believe that it bears clues to a treasure the acquisition of which will assure our dignity and independence. Its importance becomes even more perceptible when we come to realize that extant plans of our monuments—drafted mostly by foreigners—do not exceed a few scores, and that photographs already published in this domain cover only a few of these relics. In addition, the mediocre quality of the majority of these documents greatly reduces their value and utility. Moreover, the scatter of published documents in various books and articles hinders their usability. And as concerns the study of the buildings’ history, lengthy ways must be covered in order to achieve meager results. Thus, it is not without reason that identifying and surveying historic relics and carrying out research in this domain are arduous, indeed impossible in some cases. 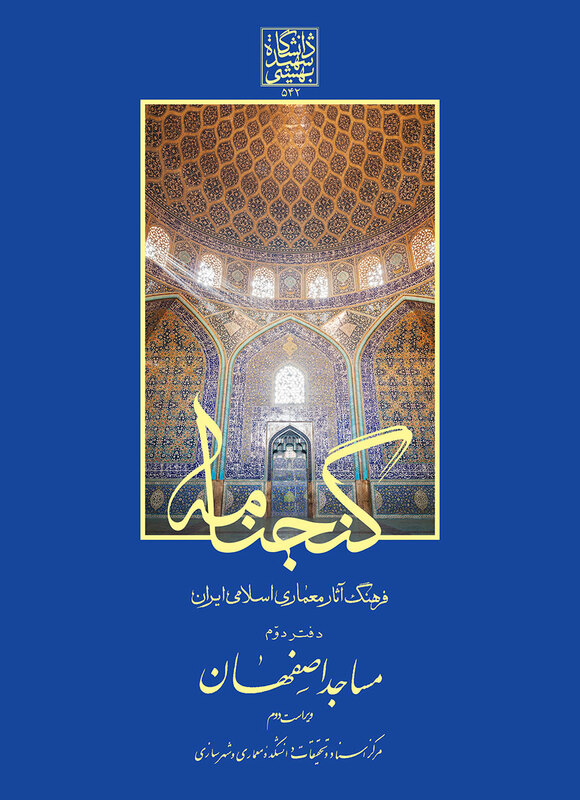 By bringing together complete and legible plans, clear and expressive images and a thematic authentic history of more than six hundred significant historic realizations*—ranging from mosques and madrasas to houses and baths—the Ganjnameh series seeks to not only initiate research in this domain but also encourage researchers, experts and all those interested to begin research of their own on these rich relics. Thus, a thematic order was adopted for the Ganjnameh series—in preference to the more common geographic one—in order to make it a handy tool for research. It is noteworthy that, wherever similar instances of a type of building exceeded a certain limit, a geographic, city by city, division has been introduced. For instance, in cases where documents concerning the houses of a city have reached a determined number, a full volume has been dedicated to the houses of that city, and when the specimens of a type of building were scattered in various cities, these have been gathered within one or several volumes. In this way, the thematic order has been preserved and the geographic order has been taken into consideration on a secondary basis, in proportion with the number of extant specimens. Another point is that this collection was not brought into being overnight. Rather, it is the outcome of some forty years of relentless efforts on the part of the professors and students of the Architecture and Urban Planning Faculty of Shahid Beheshti University. Therefore, about a half of those who have studied architecture in this country may be said to have contributed to its creation. It must also be added that compiling and recording this collection would not have been realized if it were not for the assistance of the responsible authorities of this university and faculty, as well as the dedicated efforts and eagerness of several of this faculty’s students over the course of many years. Redrafting, complementing and ordering these documents has been ongoing since 1992, and it is hoped that this young manpower will succeed in reviving this ancient heritage. 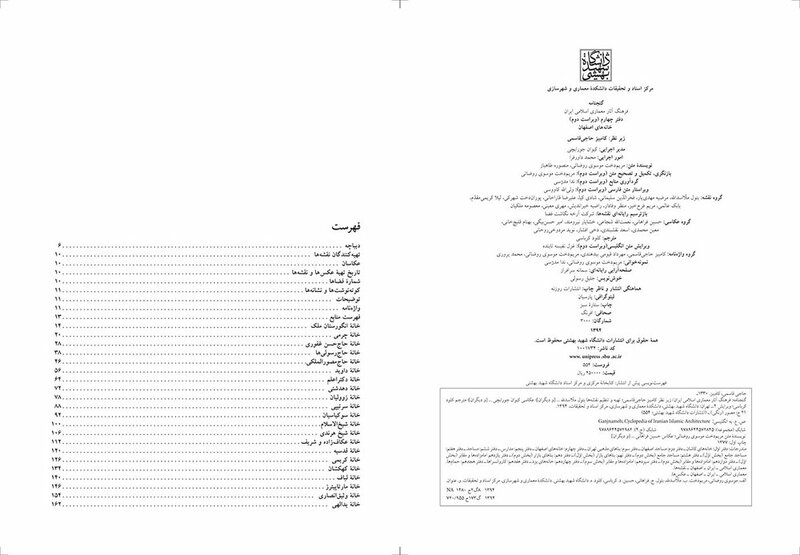 As mentioned above, the volumes of the Ganjnameh follow a thematic order. The collection embraces almost every type of building. 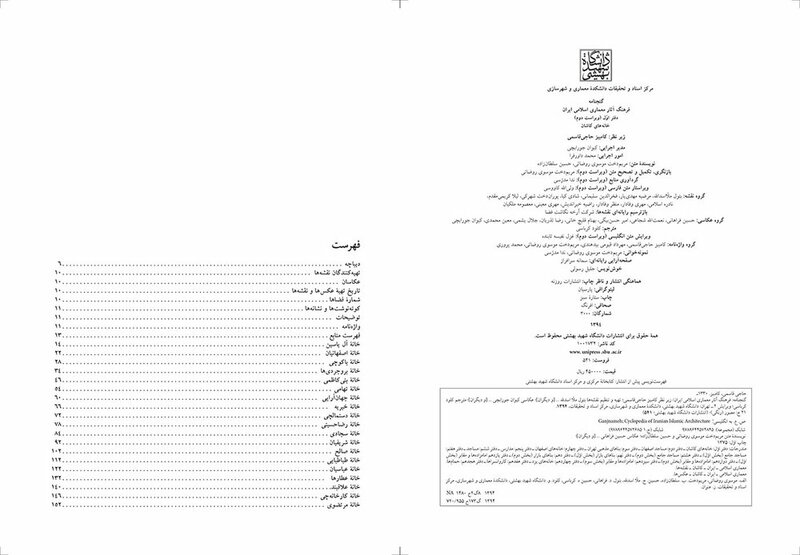 Five volumes introduce traditional houses in various cities (one volume includes the houses of Kashan, one volume the houses of Isfahan, one volume the houses of Yazd, and two volumes the houses of other cities), four volumes cover mosques (one volume the mosques of Isfahan, one volume the mosques of other cities, and two volume congregational mosques), three volumes are dedicated to emamzadehs and mausoleums, two volumes deal with bazaar buildings, one volume is dedicated to theological schools, one volume introduces caravansaries, one volume deals with baths, one volume concerns palaces and gardens, and one volume exceptionally introduces religious buildings in Tehran. 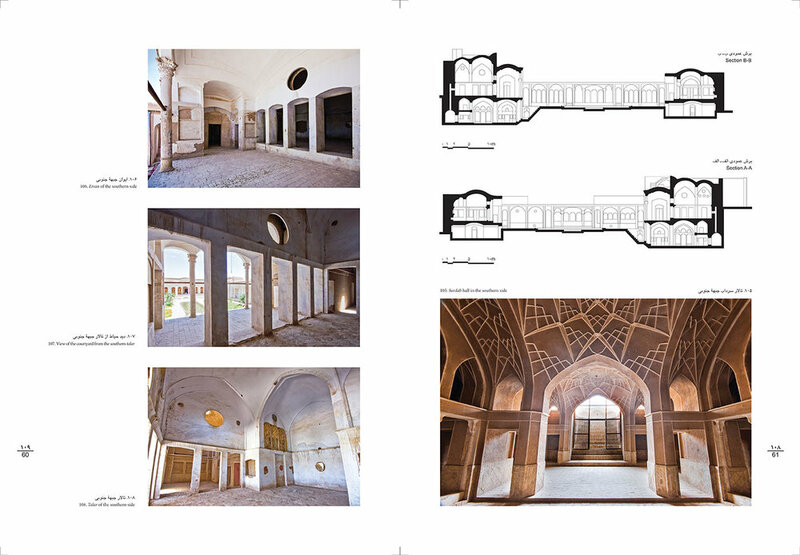 Volume 1: Mansions of Kashan. 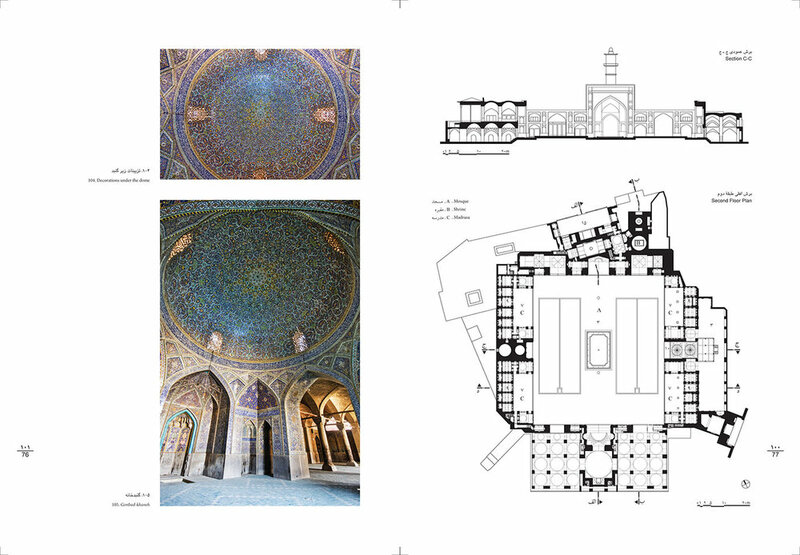 -Volume 2: Mosques of Esfahan. 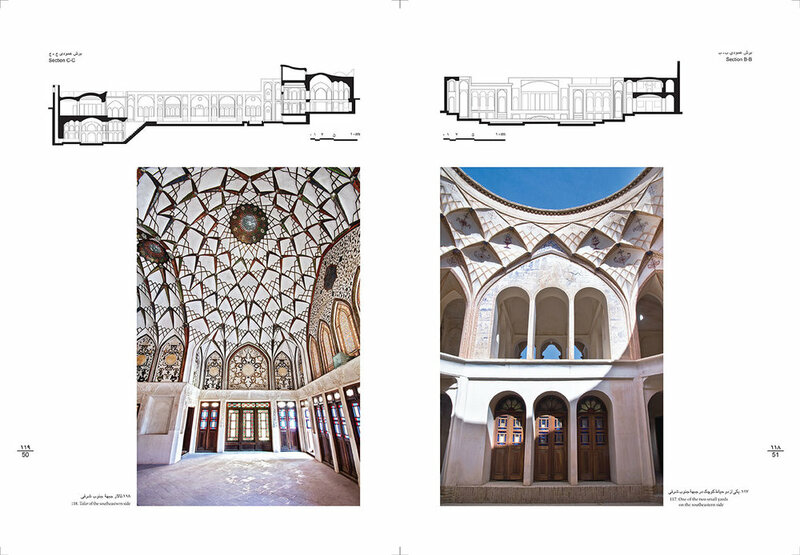 –Volume 3: Spiritual Buildings of Tehran. –Volume 4: Mansions of Esfahan. –Volume 5: Theological Schools. –Volume 6: Mosques. –Volume 7: Congregational Mosques (Part 1). -Volume 8: Congregational Mosques (Part 2). -Volume 9: Bazaar Buildings (Part 1). -Volume 10: Bazaar Buildings (Part 2). Volume 11: Emanzadehs and mausoleums (Part 1). Volume 12: Emanzadehs and mausoleums (Part 2). Volume 13: Emanzadehs and mausoleums (Part 3). 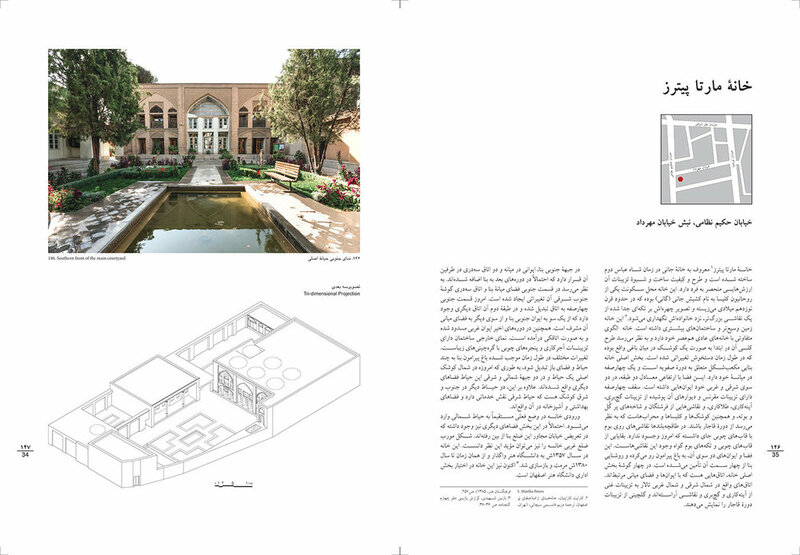 -Volume 14: Yazd houses. Volume 15: Mansions (Part 1). Volume 16: Mansions (Part 2). -Volume 17: Caravansaries. Volume 18: Bathhouses. 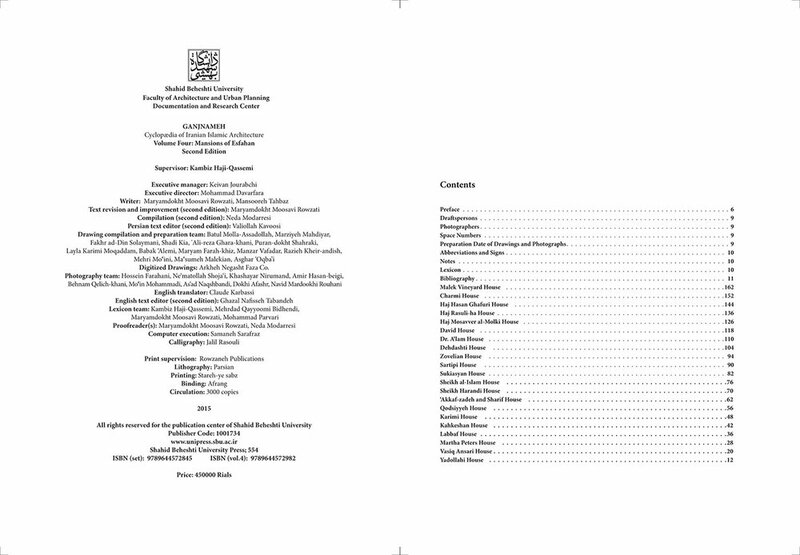 Volume 19: Gardens and Palaces (Part 1). Volume 20: Gardens and Palaces (Part 2). 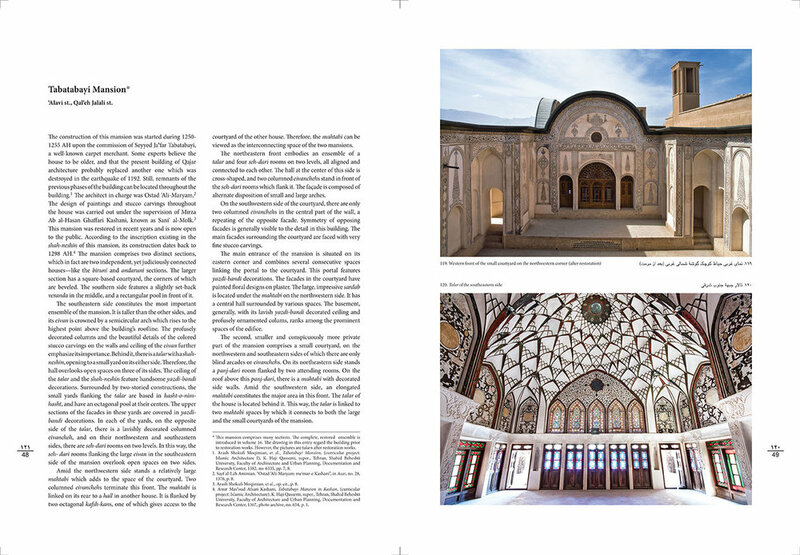 The architecture magazine Natura in issue number 13 (January-February 2014) published an administrative-commercial project designed by Behzad Ayati, Peyman Meydani and Mani Saham with photos taken by Hossein Farahani. Sarvin Project is located on Asef Street in Tehran.